TapSnap has arrived in the hub of the universe: New York City’s Grand Central Station. 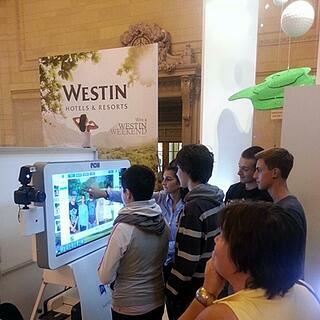 The Westin Hotels and Resorts event, called “From rush hour to relaxing” gave commuters a chance to envision their next vacation or weekend getaway Westin-style in the Station’s glamorous Vanderbilt Hall. 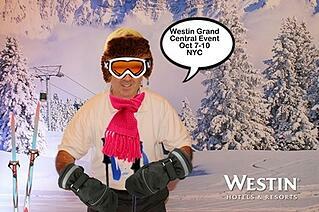 All of the incredible possibilities of Westin Weekends and Starwood Hotels were on display: ski parks, golf resorts, luxury beach vacations and so much more, as well as a chance to win one of 800 fabulous prizes, everything from a Westin Weekend to free meals at their fabulous restaurants. The four-day, four machine extravaganza was a major deal for New Jersey-based franchisee Milton Guerrero – the kind of event he knew was possible but hadn’t seen yet. The deal was so big he teamed up with Philadelphia franchisee Ben Bender who contributed two of his machines. The event averaged 1,000 to 1,200 pictures a day, and while it didn’t take advantage of TapSnap’s social media sharing capabilities, guests were encouraged to email and share their pics on their own social networks. Milton was contacted by a company called Chase Design who was working for Westin Hotels.